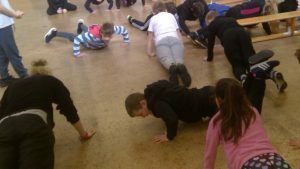 Home / Sports Blog / Super Schools! 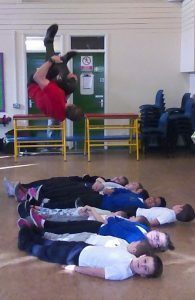 On Thursday 7th February, our children were visited with a visit from GB gymnast and European Junior Champion Jessie Brain and Parkour Star Alex Grinter. In 2016, we were joined by 2012 Olympian hurdler Rhys Williams and Thursday’s visitors were equally as impressive. 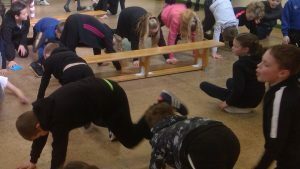 All of our children took part in some activities (such as spotty dogs, star jumps and press ups). 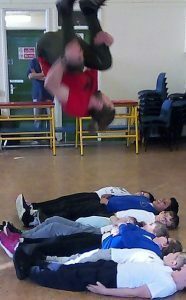 Even some adults took part as well! They also had a photo taken with Alex, which will be sent back to our school in the next few weeks and the morning concluded with a breath-taking assembly and showcase of their talents. Please see below for some photos of the day and check your child’s class blog to see if there are any additional photos of your child’s class! If your child was sponsored for taking part in this, please could I ask that any sponsorship money is brought into school by Friday 15th January please. Thank you for your support with this.